KATHLEEN NOWAK TUCCI. Secret Garden Necklace of recycled motorcycle and bicycle inner tubes and Nespresso coffee capsules, Second Place Alternative Metals/Materials. Springtime is a special season for the Rio Grande company in Albuquerque, New Mexico. Each May there is cause for celebration as Rio Grande announces the recipients of the Saul Bell Design Award competition. 2016 marks its sixteenth year of honoring distinctive work in jewelry design. The Award invites artists to select from seven specific categories of materials to produce innovative works which are then juried in two rounds by accomplished experts in the field of jewelry. This year’s diverse blend of jurors for the final round included Teresa Frye, Jeffrey Herman, Karen Lorene, G. Phil Poirier, and Jim Tuttle. Final round judges examine each finalist’s piece by hand and as worn on a model. Teresa Frye is a leading expert on jewelry casting and president of TechForm Advanced Casting Technology. With an international reputation for quality craftsmanship, Herman began his life as a silversmith while still in high school, and went on to found the Society of American Silversmiths to preserve and promote this beautiful artform. Gallerist Karen Lorene heads Facèré Jewelry Art Gallery in Seattle, Washington, one of the few prominent galleries in the United States still showing original works by contemporary studio jewelers as well as antique jewelry, a passion of Lorene’s. A master gem-cutter and practicing artist, Poirier is owner of Bonny Doon Engineering where he develops hydraulic presses for the jewelry industry. Founder and president of Green Lake Jewelry Works, Tuttle’s company is one of the largest custom jewelry shops with over fifty jewelers in one location. JUSTINE GAGNON. Monsieur Bracelet of sterling silver and plastic tube, Second Place Emerging Jewelry Artist. Another public acknowledgment of her innovative recycled jewelry, this is the second consecutive year that Kathleen Nowak Tucci has placed in the Alternative Metals/Materials category, this time with her Secret Garden entry, whose secret is to be discovered on the back of the necklace. Her materials range from bicycle and motorcycle inner tubes to the bright metallic colors of Nespresso coffee capsules. Garen Garibian’s prize-winning piece The Queen must in some part be considered a labor of love—the ring took two years to make, a deliberately gradual process. Garibian’s interests reside not just with achieving some fabulous physical tour de force but also with setting personal challenges to resolve through the execution of his careful, exacting skill set. Enamelist Amy Roper Lyons has secured a third Saul Bell Design Award with her beautiful celestial bejeweled celebration of the universe. Her Orbit #2 is part of an ongoing series inspired by photographs taken of deep space by the Hubble Telescope. A self-described perfectionist, Roper Lyons is all hands on, from her enameling knowledge and practice of cloisonné, plique-à-jour and basse taille to her metalsmithing repertoire of traditional goldsmithing techniques. Patrik Kusek’s submission is centered around personal loss—his mother has dementia, and Memory Interrupted was designed for and dedicated to her. It is an extraordinarily lovely tribute to Kusek’s mother, and has a life beyond the personal as it quietly communicates to those responding to its poetic beauty. Kusek works in many materials, not just metal clay, and he cites Judith Kinghorn and Harold O’Connor as having been important to his professional development. SAMANTHA FREEMAN. Peacock Pin of eighteen karat gold, Namibian tourmaline, diamonds, and sapphires, Second Place Gold/Platinum. ZOLTAN DAVID. Moonshine Pendant of platinum, cobalt chromium steel, stainless steel, diamonds, and moonstone, First Place Alternative Metals/Materials. AMY ROPER LYONS. Orbit #2 Pin/Pendant of eighteen and twenty-four karat gold, enamel, lapis, and diamonds, Second Place Enamel. Because Samantha Freeman’s The Peacock Pin was so complicated to make, and entirely hand-fabricated, she first constructed a silver model before going on to actually make the piece in eighteen karat gold, Namibian tourmaline, diamonds, and sapphires. Her two biggest historical influences have been Fabergé and Lalique, but contemporaries, like studio jeweler Tom Herman, are also considered as important mentors, including Alan Revere who has been a major influence on decades of novice and professional jewelers through his Revere Academy of Jewelry Arts, in San Francisco. SEUNG JEON PAIK. Unity Brooch of silver and eighteen karat gold, First Place Silver/Argentium® Silver. TOM FERRERO. Mace of silver, twenty-four karat gold over sterling, copper, resin, enamel, Italian acetate, and over two hundred gems including diamonds, garnets, citrines, topaz, amber, and zircon, First Place Hollowware/Art Objects. WOLFGANG VAATZ. Neckpiece of sterling/argentium® silver, unrefined placer gold, twenty-two karat gold, quartz crystal carved by Tom Munsteiner, Second Place Silver/Argentium® Silver. An MFA student at the Savannah College of Art and Design (many of its graduates go on to become prominent studio jewelers), Seung Jeon Paik secured First Place in the Silver/Argentium® Silver Category, a nice coup for this already accomplished young designer. This also is Paik’s first Saul Bell Design Award. “Everything in the universe is composed of particles,” is the statement that serves as the source for his inspiration. His Unity Brooch utilizes the technique of granulation to illustrate them. Paik uses thirty-two-gauge silverwire onto which eighteen karat gold granules are fused and employs Rhino 3D software to position the wires and the golden grains. “Mastery of skill is an important aspect of my work,” states Paik. “Artists obtain this mastery with deep understanding of the materials, tools, techniques, and possibilities of application.” He regards SCAD professor Jay Song as a mentor—one who encourages Paik to balance academics with life outside it—and the late artist Hermann Jünger, a pioneer in contemporary jewelry. Debbie Sheezel, not only an accomplished enamelist but also painter, took First Place in Enamel. In making jewelry, her priority is with its wearability: “to me they are wearable art.” She points out that her creativity is “completely unpredictable. Anything can trigger it. Enamels are time-consuming and have rules that must be obeyed, but the outcome is so beautiful that the time spent is worth it.” She is one of a number of finalists who reside in countries other than the United States (in her case, Australia) who bring a global component to the Saul Bell Design Award, which increasingly has as one of its primary goals internationalization of the competition. There is still time to enter for 2017. Registration is open until October 27, 2016, with its springtime salute to the winners on May 21, 2017 in Albuquerque, New Mexico. Visit www.saulbellaward.com for more information about submitting applications. PATRIK KUSEK. Memory Interrupted Necklace of pearls, simulated citrines, peridots, silver PMC, and twenty-two karat gold, Second Place Metal Clay. 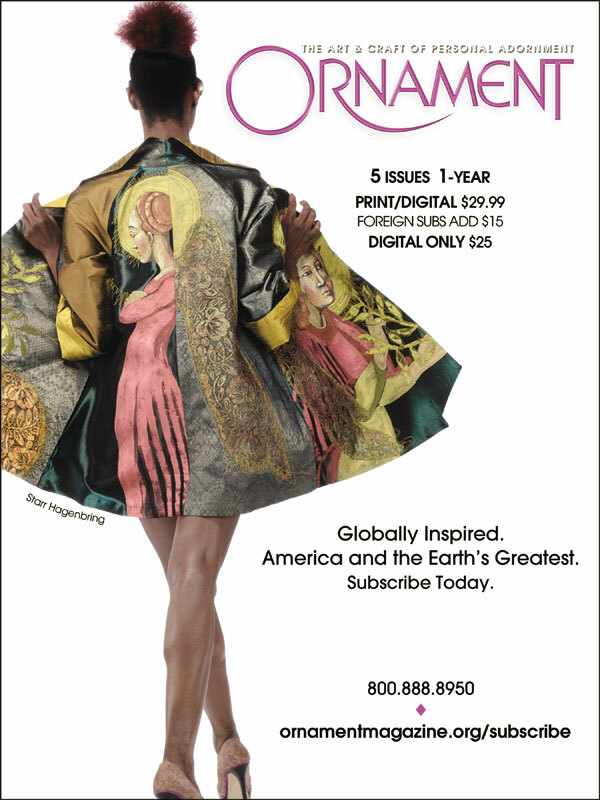 Carolyn L. E. Benesh is Coeditor of Ornament and the magazine’s expert on contemporary wearable art. As Ornament resident itinerant, she moves to and fro across the United States in search of inspiring craft, great experiences, and of course, excellent food. Among her yearly stops are the Smithsonian Craft Show in Washington, D.C., and the Philadelphia Museum of Art Craft Show in Pennsylvania, both occasions to meet old friends and make new acquaintances. This issue she gives her appreciation for the winners of Rio Grande’s Saul Bell Design Award, acknowledging the excellence in craft that the competition promotes. KENT RAIBLE. From The Deep Necklace of eighteen karat yellow and twenty karat pink gold, platinum, indicolite tourmaline, tsavorite, garnets, rubies, and diamonds, First Place: Gold/Platinum. Given the diversity of its categories, the Saul Bell Design Award competition is always fascinating to observe after its winners have been announced, as they now have for 2015. The competition never fails to serve up a rich potpourri of decorative and functional objects, from the classically inspired to the forward-looking avant garde. Since 2001 the competition has celebrated the art of jewelry and more. In an age when competitions continue to steadily decline, the Saul Bell Design Award is a supportive outreach to artists creating beautiful and challenging works and for public recognition of their achievements. Sponsored annually by Rio Grande of Albuquerque, New Mexico, the Saul Bell Design Award receives its name in homage to founder Saul Bell who began the company in 1944 during one of the more perilous times in the twentieth century. Bell grew it from modest beginnings on historic Route 66, the Mother Road, (passing through the heart of downtown Albuquerque), to a jewelry leviathan which later encompassed many of the sizable Bell family as active participants in the enterprise. It morphed ever larger from a company of one to over three hundred, and through changing locations, now residing on Albuquerque’s Bluewater Road. By 2013 Rio Grande had merged its rich resources with The Richline Group, a Berkshire Hathaway Company, perhaps its last permutation. Paterfamilias Bell died in 1996 at the age of ninety-six, still working, but the jewelry legacy of this fearless innovator moves forward into yet another transformative age. ANDY LUCAS. Constrained Timelessness Pendant of gold, sterling silver, aquamarine, citrine, amethyst, sapphire, tsavorite, and black and white cognac diamonds, First Place: Silver/Argentium® Silver. SANDRA MCEWEN. Empress Theodora Pendant of sterling silver, eighteen karat gold bezel wire, twenty gauge gold wire, enamel, citrine, Second Place: Enamel. HOLLY GAGE. Je T’aime—Dual Flame Necklace of precious metal clay, pearls, peach sunstone, faceted hematite beads, Second Place: Metal Clay. In a first for the competition, Kent Raible of Mossyrock, Washington, secured both First Place in the Gold & Platinum and the Hollowware categories with tour de forces in From the Deep Necklace and The Pregnant Chalice, which honors “a holding place or womb for the sacred or for creative potential.” Raible’s development seems to have destined him early for the life of a goldsmith beginning with his first jewelry class while in high school to his relatively straightforward trajectory as a recognized exemplar of granulation. Basically self taught, propinquity intervened when a six-month bicycling tour of Europe in 1980 (which lasted for two years) took Raible to Germany, where he studied at the Hochschule für Gestaltung Schwäbisch Gmünd and could pursue a deepening passion for granulation. This ancient decorative element from the dawn of classical antiquity, the Middle Ages and the Renaissance, is worked anew in the hands of goldsmith Raible. His lifelong concentration on this most precise of jewelry techniques has taken him to fresh, unexplored and rewarding challenges, and now to ultimate recognition with the Saul Bell Design Award. How do you take a diverse mixture of gold, sterling silver, aquamarine, citrine, amethyst, sapphire, tsavorite, and black and white cognac diamonds and make them work as a coherent whole? Well, Andy Lucas, of Klamath Falls, Oregon, has in an extraordinary pendant which won him first place in the Silver/Argentium® Silver category. Endlessly fascinated by these jewels of the earth, gemstones are a major source of stimulation and fundamental to his complex compositions. Nature’s perfect geometry is another avenue to the successful actualization of his work, and the amazing intersection and interaction of multiple planes and lines, which he interprets and re-interprets in his jewelry, take him into astonishing explorations of the mysteries that lie at the heart of creation. Hailing from Oak Park, Michigan, Ivy Solomon utilizes a combination of metal clay, pigmented epoxy resin and sterling silver to make her colorful, spirited jewelry. Solomon’s ability to finesse metal clay has gained her Saul Bell Design Awards in 2004, 2006 and now 2015. Inspired by a Japanese artistic motif called noshi, her First Place in Metal Clay for 2015 is for a brooch entitled Good Fortune. Dating from early Japan, and originally using only noshita awabi (dried abalone strips), noshi evolved into an origami fold of white paper and with the dried abalone were attached to gifts as an expression of good wishes to the recipient. Solomon’s lovely interpretation is an instructive reminder of how the creative act takes inspiration from the world around us and from time immemorial. KATE HUBLEY. MagiSphere Concept Pendant of sterling silver, fourteen karat rose gold, black diamonds, Second Place: Silver/Argentium® Silver. GENEVIEVE FLYNN. Ssssssumtuous Tea Vessel of sterling silver, Second Place: Hollowware/Art Objects. IVY SOLOMON. Good Fortune Brooch of sterling silver square wire, sterling silver sheet, precious metal clay, and colored epoxy resin, First Place: Metal Clay. 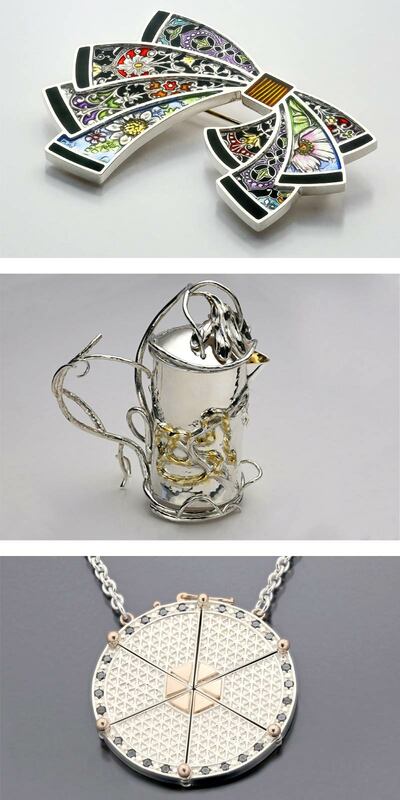 For those familiar with the jewelry of Kathleen Nowak Tucci, her award for Alternative Metals/Materials is welcome acknowledgment of her innovative recycled jewelry. Tucci’s eye and hand have special receptors for objects that get thrown into the landfill, building the mountains of waste that bedevil the modern world, endangering our survival. Her compositions derive from bicycle and motorcycle inner tubes to the bright metallic colors of Nespresso coffee capsules. Her Hummingbird Necklace which took First Place, while notable for the idiosyncratic use of a well-known commercial product, was also elevated and transfigured by Tucci’s knowledge of color theory and design, her singular artistic expression and a healthy respect for the importance of wearability no matter how unlikely the material. Tucci resides in Atmore, Alabama. From Budd Lake, New Jersey, Jennifer Park took First Place in Enamel with her Streaming Turquoise Brooch, an exquisite image of an idyllic Edenesque landscape. A turquoise-colored cloisonné river flows around a center-set stunning piece of turquoise with touches of golden mountains receding in the distance. It is a wonderful meditation on Mother Earth and its life sustaining properties. Like Raible, her brooch also incorporates granulation. Park uses transparent colored enamels on fine silver to capture the many moods she seeks to conceive. Primary among them is honoring the awe-inspiring ability of nature to help us respect the world as a sacred space. Formerly a graphic designer, she received her bachelor of fine arts from the University of Tennessee and a master’s degree in jewelry and metals from New Jersey City University. In addition to the Saul Bell Design Award, Park has been honored by the Niche Awards, MJSA Vision Awards and the Halstead Bead Jewelry Design Business Development Grant. It takes hard work and dedication to become a successful jewelry artist, and it was to honor that commitment that Rio Grande established its Emerging Jewelry Artist Award for those twenty-one years of age or younger. Lisa Krulasik, from Glendale, New York, took First Place, followed by Elly Cernohorsky of Halls Head, Western Australia, and Ella Calas of Grosse Pointe Farms, Michigan. Krulasik’s Hollow Brooch, a model of structured simplicity, shows the work of someone already demonstrably talented. Currently working on her bachelor of fine arts jewelry thesis, she is preparing for her spring 2016 show with a presentation of fifteen major pieces. She also is planning to enter another Saul Bell competition, and wants the committee to keep “an eye out” for her submission. More than the Rio Grande group will be keeping on eye out on Krulasik’s progress. JENNIFER PARK. Streaming Turquoise Brooch of sterling silver, twenty-two and eighteen karat gold, twenty-four karat gold foil and cloisonné wire, enamel, turquoise, and diamonds, First Place: Enamel.